We know there have different types of pores in concrete; of which some allow water to flow within concrete i.e. allow permeability and some do not permit water to flow. So it is important to determine relationship between porosity and permeability. Porosity is used to define proportion of total volume of the concrete that is occupied with pores and generally expressed as percentage. 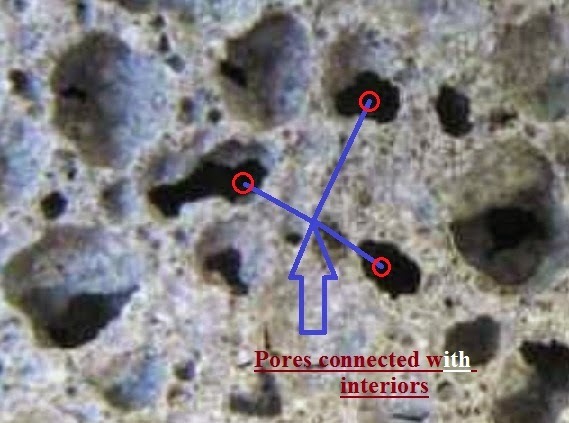 We know to be permeable, porosity is an essential factor but these pores only allow flow when they are interconnected with each other. An interconnected pore system with high porosity, allow fluids to transport through the concrete; thus contributing permeability to concrete. If the pore system is discontinuous or however pores are ineffective in respect of transportation of fluid, the permeability of concrete will be low, even the concrete mass have high porosity. The absorption of concrete provides some indication about porosity of the same. The porosity can be conveniently measured by mercury intrusion; but other fluids, for this purpose, can be used too. Hover and Cook studied extensively on measurement of porosity. Dear reader in our next post we will discuss about other processes including permeability to ingress water or other fluids into concrete.